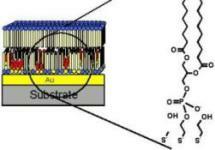 The objective of the present article is to present recent advances in the construction of affinity chemical sensors based on lipid membrane technology in which the recognition element is a natural or artificial receptor, antibody, enzyme, etc. that can be manufactured by using standard methods of microelectronics and micromechanics. These novel devices will be used as chemo- and biosensors for the detection and quantification of environmental contaminants and food toxicants such as insecticides, herbicides, pesticides, auxin hormones, heavy metals, arochlor, polycyclic biphenyls ( pcbs ), and other hazardous pollutants in foods and real environmental samples such as fruits and vegetables, dairy products, waters, etc . Recent research is directed to the construction of a portable mini device that will readily be able to have many applications in science.